Although it is common to see percussionists holding four mallets, using six is still somewhat rare. Award-winning composer and percussionist Robert Paterson has spent his entire career developing this technique and writing pieces that utilize this technique. To date, he has written more works for this technique than anyone else in the world. This is the world's first all six mallet marimba album, and it pays tribute to his roots as a percussionist, and specifically, the marimba. With this collection of works, Paterson sets out to prove that this innovative, groundbreaking technique opens the door for creating new timbres and colors, richer harmonies, and a more varied sound palette on the marimba. 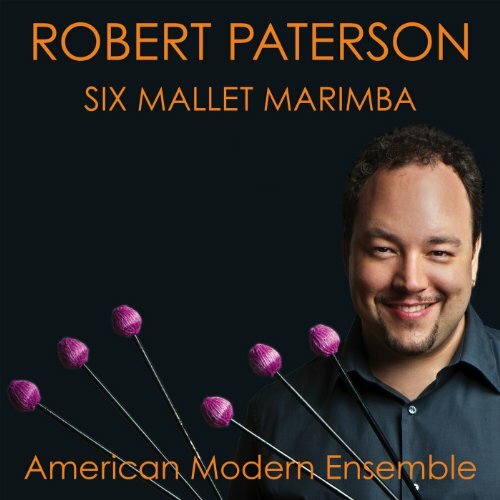 All of the works on this album feature the marimba and are performed by Paterson and members of the critically-acclaimed American Modern Ensemble. Works Include Komodo and Piranha for solo marimba, Stillness for oboe and marimba, Clarinatrix for bass clarinet and marimba, the three movement Duo for Flute and Marimba, the six mallet version of Tongue and Groove (there's also a four-mallet version) for alto saxophone and marimba, Braids for violin and marimba, Links & Chains for violin and marimba and Fantasia for tuba and marimba. Duo for Flute and Marimba (Sato Moughalian, flute and alto flute): three-movement, fifteen-minute work for flute (doubling alto flute) and five-octave marimba. First movement uses six mallets, second uses four and third movements uses five. Tongue and Groove for alto saxophone and marimba (Jeremy Justeson, alto saxophone): work for alto saxophone and five-octave marimba, there is also a four-mallet version of this work (featured on AMR Pimpin' album). Fantasia for tuba and marimba (Dan Peck, tuba): Paterson's first duo for marimba and another instrument, for 4 1/3 octave marimba and tuba.